We’ve been reviewing a number of companies recently that would appear to be older, established firms but are actually newer companies that are trying to evoke old-school style, luxury and designs. Frederique Constant watches fall into that category; if you look at their products, you’d think they must be the work of a company that’s at least 100 years old. That’s not the case; Frederique Constant watches have only been available since 1988. Founded by a Dutch couple but based in Switzerland, these watches feature elegant designs, cutting-edge innovation and top build quality. As a bonus, most of their watches fall into the moderately expensive range, making them a relative value in a market where prices can easily reach six figures. If you’re looking for something that’s new, exciting and attractive, these interesting watches are well worth a look. Read on for the full Frederique Constant watches review. The build quality is quite good; they use stainless steel and rose gold to build their cases and rock-hard sapphire crystal to protect their watch faces. Water resistance is good, especially considering that these are not sports watches, and most models are rated at 30-100 meters of water resistance. These are well crafted, Swiss-made timepieces that should run well for years with proper care. These watches offer roughly 150 different models at present, and about 100 of them feature automatic movements. The remainder are quartz; these are mostly at the lower end of the price range. Both types of movements are Swiss-made and are produced in-house. For a relatively new product, you’ll see a surprising amount of innovation. The company developed the silicon escapement wheel, which uses ultra-light silicon to help make the movement more accurate. Their trademark Heart Beat movement has a unique bridge for the balance wheel on the front side of the movement, and these are usually visible, surrounded by a heart shape on the face. A few of their high end models also include a tourbillon. It’s unusual to see such innovation from a new company, but that’s what you have to do to compete with established makers, and Frederique Constant watches are certainly competitive. As befits a luxury Swiss brand, the styling is relatively traditional. All displays are analog, and while you’ll find a few models with chronograph features, you’re not going to see outlandish colors or face shapes. These are austere, attractive timepieces that are well made and many of their models include elaborate complications, such as day, day/date, moon phases, a world timer, power reserve indicator, and the aforementioned tourbillon. 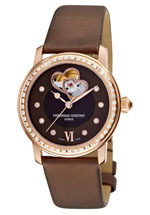 If you like bling, Frederique Constant watches are also available with gold cases and about two dozen models include diamonds in their designs. Straps are available in steel, satin and a number of exotic varieties of leather. Cases are available in three sizes, too, to accommodate those with wrists of all sizes. The care and maintenance will vary, depending on the model. Those with quartz movements will need to have the battery replaced every two years or so. Models with automatic movements will need to be serviced every three to four years. This will involve inspection, cleaning and lubrication of the moving parts. Aside from these considerations, you should store your watch away from extremes of temperature or strong magnetic fields and you should keep your automatic models stored in a watch winder to keep them running properly and accurately. A cool, dry place is the best place to store your. With proper care, these watches should run indefinitely. The warranty is average; the company warrants their products for two years from the date of purchase against defects in materials and workmanship. These timepieces are thoroughly tested at the factory before shipping, so defects are probably quite rare. You’ll find that prices are moderately expensive, as luxury timepieces go. The product line starts at a suggested list price of $795 and the most expensive model currently offered by the company has a list price of just over $50,000. While that’s a lot of money, the bulk of the company’s models are priced in the $1000-$5000 range, which is actually quite reasonable when compared with other Swiss luxury brands. Collectors like the brand but haven’t yet started paying huge prices for them on the secondary market, but that will likely change over time as the brand becomes better-established in the marketplace. As with most luxury brands, these are sold through a select group of retailers, which are mostly high-end jewelry stores located in major cities. By restricting the distribution of their products, the company is able to maintain the idea of scarcity, and avoid having their products appear to be ordinary or common. 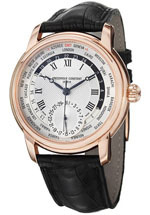 You cannot, however, buy Frederique Constant watches at the official Website. This also helps keep the prices high, although unofficially, you can find them online, often at a discount. 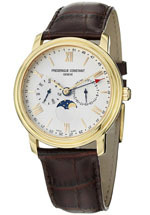 While there aren’t many online dealers who sell Frederique Constant watches, you can save quite a bit of money that way. Keep in mind that the product line is huge, and no dealer, online or off, is likely to carry the entire product line. For a relative newcomer to the luxury timepiece market, Frederique Constant watches offer a nice selection of products with great styling, innovation and performance. They offer the convenience of quartz movements for those who want them, while providing mechanical movements and elaborate mechanical complications for those who like gadgetry. Pricing is high, but only moderately so; Frederique Constant watches compare favorably against other luxury watch brands when it comes to pricing. If you like old-school style combined with cutting edge features and performance, you can’t go wrong with Frederique Constant watches.